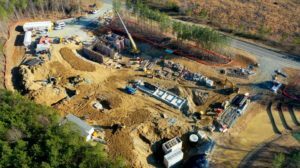 The Chatham Park Decentralized Wastewater Reclamation Facility is currently under construction on Eubanks Road and Business 64 in Pittsboro. The facility is nearly unique, one of a few of its kind in the country. The plant will use eco-engineering processes to clean Pittsboro’s wastewater and convert it into non-potable water that can be used in agricultural, industrial and landscaping applications. The first system of the kind similar to the Chatham Park’s facility is at Emory University in Atlanta, and was designed by Tim Baldwin. Baldwin is vice president of McKim & Creed, a Raleigh-based company specializing in engineering, and is also the engineer for the plant in Pittsboro. Wastewater from Chatham Park’s North Village will go to the reclamation plant to be processed using organisms that consume nutrients such as nitrogen and phosphorus that are present in wastewater during the biological nutrient removal process. Baldwin described the five-stage process like a bug house which includes habitats that the organisms thrive in. At each stage, different organisms consume organic contaminants, converting them into biological cells, non-biodegradable organic byproducts and carbon dioxide. The finished plant will also include a greenhouse which helps complete the nitrification process. Reclaimed water can be cleaned to one of two levels. Tier one, the most common, is used in industrial applications like 3M, located south of Pittsboro, which uses reclaimed wastewater from the Pittsboro Wastewater Treatment Plant in its production. The wastewater at the Chatham Park plant will be cleaned to a tier two level, the most stringent in terms of wastewater reclamation, allowing it to be used for food crops and irrigation. “We believe our water will be able to be used for any permitted use in the future,” Baldwin said. The plant is also designed to be doing more nutrient removal then the typical reclamation plant. Baldwin noted this was an important aspect of the design, as the current Pittsboro wastewater plant was going to have to upgrade to keep its permit in light of Chatham Park. The water reclamation plant is part of a larger wastewater needs program which includes a force main line to Sanford’s Big Buffalo Wastewater Treatment plant. The town’s small wastewater treatment plant is nearing its capacity if all projects with allocations were to request permits, according to statements made by the town’s engineer, Elizabeth Goodson, during a regular board meeting in March. The plant is hoping to be online this fall and will begin to treat wastewater to ease the town’s overburdened system as the force main is constructed. Gruesbeck added that the plant will aid Pittsboro in its “efforts to provide re-use water locally” and “minimize the impact of development on local surface and fresh water. Boucher said every inch of the Chatham Park wastewater reclamation plant is designed to conserve resources and promote a healthy environment, even the roof, which is slated to be “a grassy area that helps clean the air, reduce the possibility of flooding during heavy rainfall, conserves energy and provides a pleasant area to relax.” It could even be used for gardening. Often, wastewater treatment plants are hidden to keep the processes and potential odors away from the general population. 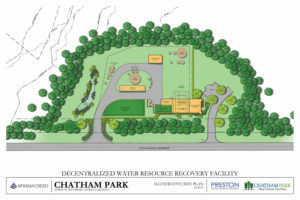 But Baldwin hopes Chatham Park’s water reclamation plant will be different — an opportunity not only for sustainability, but also partnerships with educational outreach and university research. The plant will include an educational center and staff will tours of the facility to show how it works. The facility will be owned and operated by Old North State Water Company, with the town serving as its only customer. The town will still continue to do billing and customer interface. Chatham Park commissioned McKim & Creed to design the facility and locate an entity to operate it. That’s when Old North State was brought on board. Old North State is financing the $30 million facility, which will have an initial capacity to process 500,000 gallons per day. The five-acre site could expand to up to 2 million gallons a day if needed. As it’s privately funded, the cost for the project is not on the town or its taxpayers. This is similar to the case with the force main to Sanford where Chatham Park is picking up about 62 percent of the cost of that project as well. 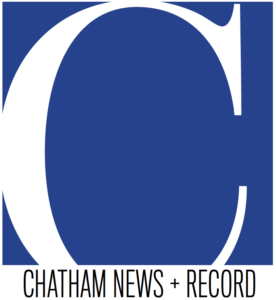 “It made sense for Chatham Park to take up their share of the debt for the infrastructure it will need,” Baldwin said.